Two polls at the weekend illustrated starkly the absence of consistency among individual snapshots of opinion at this election. One, carried out by Opinium for the Observer, put the Tories four points ahead of Labour. Another, carried out by YouGov for the Sunday Times, put Labour three points ahead of the Tories. This kind of pattern is nothing new. Indeed, I’d have hoped by now that most pundits and media commentators, if not politicians themselves, would have lost the habit of taking individual polls at face value and bothering to treat them as news. Those leads we saw at the weekend would be worth taking seriously only if either was being repeated in a number of polls from different organisations. They are not. Nothing is being repeated. Which is why a poll of polls can be valuable in flattening out wild variation and giving more sense of long-term trends. Labour looked like it was opening up a slim lead over the Tories in early April, but it has not been sustained and both parties have reverted to their familiar positions of being virtually neck-and-neck. Individual polls can also suggest dramatic fluctuations in the performance of the three smaller national parties. But again, a poll of polls implies that, of late, it’s pretty much business as usual. Even the trends I thought I detected last week haven’t really materialised over the past few days. 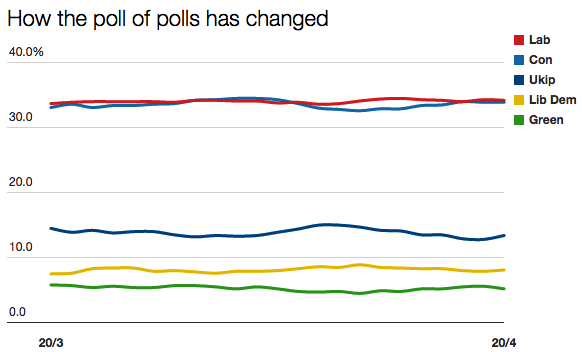 Neither Ukip nor the Greens are steadily dropping; the LibDems aren’t steadily rising. To be fair to the bulk of the pundits, I’m no longer seeing one-off polls given quite the over-the-top treatment they were receiving earlier in the campaign. This reached a nadir with the Guardian’s front page headline ‘The day the polls turned’, when two of the five published that day implied they most certainly hadn’t. With people already voting in this election (the first postal votes were sent out almost a week ago), daily polls will only become increasingly irrelevant as 7 May nears. A part of me almost wishes they were banned in this country during the last few days of the campaign, as in Australia. It would certainly force everyone to find something else about which to talk wisely/speculate dangerously. Indeed some of the polling done since last week may include some people who have already voted and this segment should increase as we get nearer to 7 May. Incidentally Conservatives started challenging NI seats in 1992. Perhaps Cons and UKIP may challenge them all in election after this one. Am I the only one who finds it ironic that the Conservatives keep telling voters to “stick to the plan, a plan that is working…” when they themselves are sticking rigidly to a plan (highlight the economy, smear potential Lab/SNP deals) that quite clearly isn’t shifting the polls an inch? Nice to see Ashcroft Polls today from Edinburgh S and Edinburgh N&L.